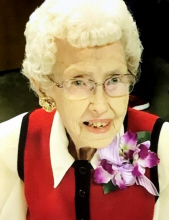 Mildred Marie Davis, age 101, of Charleston, IL went home to be with the Lord on Tuesday, March 26, 2019 at Sarah Bush Lincoln Health Center. Mildred was born February 13, 1918 in Arcola, IL to Elmer Lincoln and Faye (Dorris) Hallowell. She married Kenneth L. Davis. He preceded her in death in 1985. Mildred was a member of Oak Grove Separate Baptist Church. She worked at Brown Shoe Factory, Kroger, and Clark’s Cleaners, which later sold to Byrd’s. Mildred was preceded in death by her parents, her husband, one brother, and two sisters. She is survived by one daughter, Carolyn Davis of Charleston, IL, and several nieces and nephews. Funeral services will be held Saturday, March 30, 2019 at 11:00 a.m. at Krabel Funeral Home in Oakland, IL. Visitation will be held one hour prior to the service, beginning at 10:00 a.m. Burial will follow at Embarrass Cemetery. For those who wish, memorials may be made to Oak Grove Separate Baptist Church. To send flowers or a remembrance gift to the family of Mildred M. Davis, please visit our Tribute Store. "Email Address" would like to share the life celebration of Mildred M. Davis. Click on the "link" to go to share a favorite memory or leave a condolence message for the family.